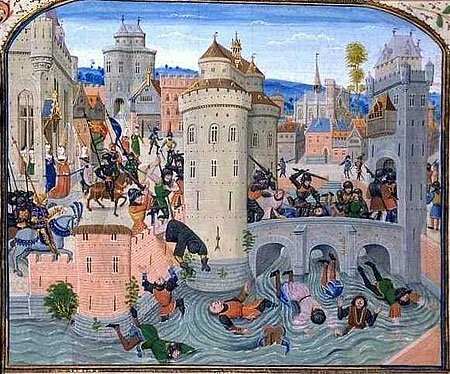 Abstract: In the eyes of the chroniclers, the Jacquerie of 1358 was the most important peasant revolt in late medieval France. Yet despite this, the uprising has not generated the quality of scholarship that other revolts from the late medieval period have encouraged, such as the Ciompi of 1378 in Florence or the English Peasants’ Revolt of 1381. In popular perception, the Jacquerie remains a violent spasmodic riot typical of the so-called ‘pre-industrial revolt’, itself a model forwarded thirty years ago and never rigourously examined. Rather than focussing on the complexity within the uprising, recent work has concentrated on whether the rebellion was co-opted by elites (a theory that this thesis will debunk); indeed, the last substantial monograph on the subject was Simeon Luce’s Histoire de la Jacquerie in 1896. Luce’s work made use of letters of remission, paid pardons issued by the French crown, to forward a more sympathetic view of the rebels. However, Luce never exploited the documents fully and quoted only occasionally from their narratives. By surveying the remissions systematically, and returning to the full population of documents available, this thesis offers ‘a wholly new view of the revolt its leadership, its geographical dimensions, duration, organisation and ideology. Moreover, it challenges many old theories about the medieval ‘crowd’ as mindless, doomed to failure and dominated by the clergy and other elites. In their place, it constructs a new model around communal ties in the medieval village, sophisticated organisation within the revolt itself and participants’ identities as the defining factor of the crowd’s ideology. Isolated, he may be a cultivated individual; in a crowd, he is barbarian – that is, a creature acting by instinct. He possesses the spontaneity, the violence, the ferocity and also the enthusiasm and heroism of primitive beings whom he further tends to resemble by the facility with which he allows himself to be impressed by words and images … An individual in a crowd is a grain of sand amid other grains of sand, which the wind stirs up at will. So wrote Gustave Le Bon in his classic study The Crowd, A Study of the Popular Mind of 1896. This image of the crowd held sway over the fields of both history and psychology for a considerable time: a revolt represents spontaneous, barbaric, primitive violence. Worse, the individuals within the movement were powerless to resist – the ‘contagion’ of the barbarism within the crowd was unstoppable. Those caught up in the riot lack control over their destiny – actions are instinctive rather than planned. The crowd gives in to its primal instincts and with it loses their capacity for reason: ‘[t]he laws of logic have no action on crowds’. Within the group, all individualism is lost and ‘impressed by words and images’ rebels possessed the same mindset.